A4 sheets of paper can be found anywhere, even supermarkets stock reams of 500 sheets for a few quid these days. The best thing about A4 sheets of paper for responsive sketching, aside from being cheap, is the fact that a single sheet can fold multiple times and give us the basic screen sizes we may be designing for. 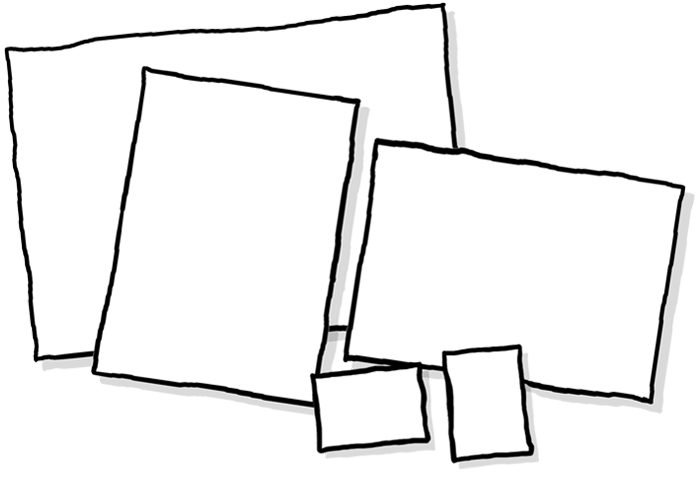 The plain A4 sheet can be used to sketch a desktop layout, fold it in half and you have two tablet sized canvases on which to sketch out portrait and landscape layouts, fold three more times and you have a basic smartphone canvas to sketch on. While not as elegant as a nice sketchbook, this method is much more cost effective when you compare a ream of 500 sheets for a few quid to a book of 60 sheets for £8+. There is a small drawback. As you are using both sides of a single sheet, your different sized sketches will inevitably collide but in this world of content out design, it works in our favour because you're better off starting with the smaller canvas and work your way up to the desktop to ensure your sketches don't cross each other. I would love to hear your thoughts on this. You can catch me on the Twitters.